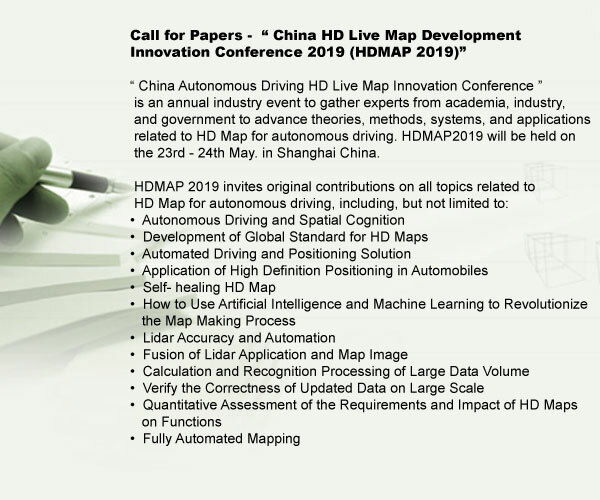 Hello，Welcome toChina Autonomous Driving HD Live Map Innovation Conference 2019! HD maps – the key to autonomous driving success? • 200+ senior decision makers from worldwide leading automotive OEMs, Tier 1, autonomous driving startups• Unrivaled Speaker Line-up 30+ renowned speakers • Content rich program with updated HD map regulations, standard, business models and technology, and future development trend• Exclusive 20+ hours of supreme networking to buid up business partnership• 50+ media partners will attend to maximize your branding exposure• Worldwide leading research institues’ projects research findings introduced ! 70% Director Above Job Positions ! Delegates Breakdown by GeographyWorldwide First class speakers with months of marketing research based programme, provide you with international pratical experiences and case studies. Bio：All businesses have a responsibility to do good. We take this to heart. In nearly 30 years of disrupting location technologies, our relentless innovation and resulting technologies have always revolved around movement. Around progress. Together we are creating a safer, cleaner world. Our easy-to-use maps, navigation software and real-time traffic information and services provide a better way forward. That’s why hundreds of millions of people, leading car manufacturers, cities, governments, technology companies and developers rely on TomTom’s products and services every day. Our people make our impact. We think big, share often, fail fast and support each other’s growth and development – as one team of more than 5,000 unique, courageous, creative problem-solvers spread across the world. Bio：SAIC Volkswagen Automobile Co., Ltd. is a joint venture between SAIC Group and Volkswagen Automobile Group. Its headquarters are located in Anting, Shanghai. It has established production bases in Nanjing, Yizheng, Urumqi, Ningbo and Changsha. As one of the oldest automobile joint ventures in China, SAIC Volkswagen has taken the lead in exploring and practicing autonomous R&D and technological innovation. It has not only trained a high-efficiency and high-quality development team, but also established a technological development center with perfect functions and international level. From the introduction of Santana technology to the joint development of Santana 2000 and Passat cars, from the exploration of self-development of Santana 3000 to the successful development of New Passat new Passat and Lavida family, SAIC Volkswagen has embarked on an innovative road from introduction, absorption, joint development to self-development. At present, the enterprise has preliminary internal and external modeling, pre-development, body development, engine, chassis and electrical integrated development and recognition of independent development capabilities. Bio：DeepMap's mission is to accelerate safe autonomy by providing the world's best HD mapping and localization services. We were founded in April 2016. Today we are a growing team of experienced engineers and product visionaries. Collectively, we have built mapping technologies in use by tens of millions of people daily. We are partnering with companies around the world who are pushing the boundaries in autonomy, including Ford, Honda, and SAIC Motor. Bio：Mappers' electronic maps and content are built on the Mappers Data Development System (MDDS), through which our maps have evolved from 2D, to 3D, and to HD. All content in the MDDS is integrated and managed on the Oracle DBMS (Spatial Format). The 3Cs (Consistency, Concurrent, Cooperative) we use in the data management, deployment system, and process represent our operational philosophy, the way we do things around here. The MDDS which encompasses on-site research, building/updating data, review, back and distribution and the unit processes (ISO9001 certified) allow us to provide you with a reliable solution. The maps that will show you every part of the world - that is the future of the innovation we dream about. Bio：GoWithMi is building the world’s first complete decentralized location-based services (DLBS) infrastructure. It aims to provide a complete trusted geospatial value exchange service for large-scale commerce from data, computing, personal terminal to commercial ecological, and making value flows multidimensional, safer and smarter, complement the last key component of the blockchain to empower the real economy application. GoWithMi's geospatial consensus ecological network consists of geospatial consensus data production, spatial computing power network, self-organizing geospatial asset node, and business application sharing support platform. Integrated DLBS, super oracle, and consensus map platform, based on the algorithm consensus to motivate participation and achieve benefit for everyone, cross-chain supports all blockchain platforms, one-stop support for all applications that retrieval location-based services, enables offline business to leap into the new era of programmable business, and enters an on chain and off chain Turing's complete self-circulation business ecology. Bio：Toyota Motor Corporation is a Japanese multinational automotive manufacturer headquartered in Toyota City, Aichi, Japan. In 2017, Toyota's corporate structure consisted of 364,445 employees worldwide and, as of September 2018, was the sixth-largest company in the world by revenue. As of 2017, Toyota is the world's second-largest automotive manufacturer. Toyota was the world's first automobile manufacturer to produce more than 10 million vehicles per year which it has done since 2012, when it also reported the production of its 200-millionth vehicle. As of July 2014, Toyota was the largest listed company in Japan by market capitalization (worth more than twice as much as #2-ranked SoftBank) and by revenue. Bio：Tsinghua University is a university in Beijing, People's Republic of China. Tsinghua University was established in 1911, originally under the name “Tsinghua Xuetang”. The school was renamed the "Tsinghua School"​ in 1912. The university section was founded in 1925 and the name “National Tsinghua University” adopted in 1928. With a motto of Self-Discipline and Social Commitment and in the spirit of the Latin Facta Non Verba, Tsinghua University is dedicated to academic excellence, the well-being of Chinese society and to global development. Today, most national and international rankings place Tsinghua as one of the best universities in China. Bio：Careland Corp. develops navigation and mapping software. The company develops satellite navigation software and electronic maps based on global positioning system (GPS) technology. It also manufactures vehicle navigation systems, driving recorders, early warning devices, and other consumer electronics. Additionally, it develops a cloud platform integrating transport management and vehicle networking systems; and offers open application programming interfaces (APIs) for developing mapping applications. The company serves electric power, logistics, transportation, government agencies, tobacco, and tourism industries. Careland Corp. was founded in 1999 and is based in Shenzhen, China. Bio：Kuandeng is one of the leading technology companies with comprehensive AI competence and superior HD mapping capabilities in the world. Kuandeng offers core autonomous driving solutions such as deep-learning based software, image recognition, 3D vision, intelligent robotics, HD semantic mapping as well as big data-driven cloud service. The company was founded by Jun Liu, former vice president of Baidu Group and distinguished head of Baidu LBS group. The core team members mainly have prominent experiences in artificial intelligence, big data, and HD mapping. Most of them come from top universities and research institutions such as Tsinghua University, Peking University, Zhejiang University, Fudan University, Stanford University, and MIT etc., or occupied as executive director of R&D at well-known technology companies such as Google, Baidu etc. Kuandeng is at the forefront of exciting new developments in high-tech fields with a strong commitment to innovation and advanced technical competence. At present, the company's professional intelligent map collection teams are marching on various highways and main lines in China. Kuandeng has already signed or arranged the product collaborations with a number of automobile manufacturers, aiming to jointly realize the production of autonomous driving technology. In addition, the company has obtained hundreds of millions investment initiated by IDG Capital. Bio：At General Motors, we are passionate about moving towards a world with zero crashes, zero emissions and zero congestion. This vision unites us each and every day, and this transformation begins with the world’s greatest employees. We set the highest standards for our company and put people at the center of everything that we do. We constantly innovate to deliver safer, better, and more sustainable solutions, to improve the communities where we live and work. Bio：NavInfo is a China-based technology company leading the way to becoming the “Digital Brain of Intelligent Driving” with core businesses in HAD mapping, high accuracy positioning and automotive-grade semiconductors for ADAS and autonomous driving. Founded in 2002, NavInfo is the market leader in navigation map, dynamic traffic information, navigation software development and state-of-the-art customized telematics solutions to both passenger and commercial vehicles. Now, NavInfo is ushering in the age of autonomous driving with a comprehensive technology development strategy and laying the foundation to become one of the most trustworthy autonomous driving solution providers in the China market and beyond. Bio：China Datang Corporation (CDT) is a leading central state-owned power generation enterprise in China and the experimental state-authorized investment and state share-holding enterprise ratified by the State Council. CDT is mainly specialized in power production and supply, power related coal mine development and production as well as related professional technical services. CDT owns Datang International Power Generation Co., Ltd., the first company in China listed in London and Hong Kong and domestically listed in 2006; Hunan Huayin Electric Power Co., Ltd. and Guangxi Guiguan Electric Power Co.,Ltd., which were domestically listed at a fairly early time; China Datang Corporation Renewable Power Co.,Ltd, which was listed in 2010; and China National Water Resources & Electric Power Materials & Equipment Co., Ltd. with a nationwide logistic network, etc. Bio：NIO’s mission is to shape a joyful lifestyle by offering smart, premium electric vehicles and providing the best user experience. NIO was founded in November 2014 as a global company. With world-class research and development, design and manufacturing centers in Shanghai, Beijing, San Jose, Munich, London and nine other locations, NIO now has more than 6,000 employees from nearly 40 countries. By the end of 2018, NIO will have user service centers in 24 different cities and the capability to serve users in over 300 cities across China. The NIO Formula E Team secured the inaugural Drivers’ Championship title in 2015. In 2016, NIO unveiled the fastest electric car in the world, the EP9. The EP9 set the lap record for an electric vehicle at the Nürburgring Nordschleife and three other world-renowned tracks. In 2017, NIO unveiled its vision car EVE and announced the NIO EP9 set a new world speed record for an autonomous vehicle at the Circuit of the Americas. NIO officially began deliveries of the ES8, a seven-seat high performance electric SUV, on June 28, 2018. Bio：Through creativity and commitment we create value for our customers, employees and investors. We understand how semiconductors increase the performance of modern technology and enable solutions that will shape our lives today and tomorrow. Developed with passion and manufactured with precision, every single product proves our will to succeed. This is what makes us a reliable partner and helps our customers to become even more successful. Bio：ALIBABA GROUP'S MISSION IS TO MAKE IT EASY TO DO BUSINESS ANYWHERE. We provide the fundamental technology infrastructure and marketing reach to help merchants, brands and other businesses that provide products, services and digital content to leverage the power of the Internet to engage with their users and customers. Our businesses are comprised of core commerce, cloud computing, digital media and entertainment, innovation initiatives and others. Through investee affiliates, we also participate in the logistics and local services sectors. Bio：China Automotive Technology and Research Center Co., Ltd. (CATARC) established in 1985, is a central government-level enterprise belonging to the State-owned Assets Supervision and Administration Commission of the State Council and a comprehensive science and technology corporate group with extensive influence in the automotive industry home and abroad. We own total assets of nearly USD 1.6 billion including net assets USD 1 billion and covers an area of about 5.4 km2. Meanwhile we have built the talent pyramid based on chief expert, reserved subject leader and young science and technology cadre, which is a human resources team with high educational background and proficiency in skill and management. CATARC always plays the industrial role as the “independent and impartial third party organization” and sticks to the development principles as “piloted by science and technology, oriented to the industry, driven by innovation and focusing on green development”. Our businesses cover: industrial service, standards, policy research, testing, engineering technology R&D, certification, big data, engineering design and general contracting, consultation, NEV, commercialized and strategic rising businesses etc. Bio：SAIC Motor Corporation Limited (informally SAIC, formerly Shanghai Automotive Industry Corporation) is a Chinese state-owned automotive manufacturing company headquartered in Shanghai, China with multinational operations. One of the "Big Four" Chinese automakers (along with Chang'an Motors, FAW Group, and Dongfeng Motor),the company had the largest production volume of any Chinese automaker in 2012 producing more than 4.5 million units, 76% of which were passenger vehicles. Its manufacturing mix likely includes a much smaller percentage of consumer offerings, as many (1,000,000+) SAIC passenger vehicles are pint-sized commercial vans.